Majestic quality, longevity, design and value are the key features of this amazing product. This exquisite deck hook measures 30-inches in length and is 0.25 inches in diameter and is made with high grade premium quality steel. Exquisite Vintage design Look Each hook culminates in an upward curl. Included is a clamp for securing the piece to a deck rail. Two 8 Inches long offset hooks can accommodate items up to 16 Inches in diameter. High grade premium steel This versatile deck-hook hanger is constructed of sturdy square bar steel, for a classic and strong stand-alone unit that is dependable in any situation amid changing weather conditions. The steel industry professionals use for great results, thus ensuring that the high-quality hook embellishes your deck and garden with splendor and grace. Only limited by your imagination with hundreds of uses in a multitude of ways; this product guarantees exquisite quality and value without compromising ease and convenience for all your deck, patio, backyard and pool house. Our mandate of super-class customer service and brand loyalty is the essence to our name. We guarantee your utmost satisfaction! We are confident you will love our products just as countless 5 star reviewers have on Amazon! If for any reason at all you are not fully amazed and lack satisfaction in any way or form, then know that we value your convenience and opinion more than anything. Guaranteed to last for years to come Our superior-quality, exquisite products guarantee sustainability, convenience, longevity and robustness, you will not be disappointed! Why wait? Add to cart and order now while supplies last! ORDER NOW and get the best product available of its kind. 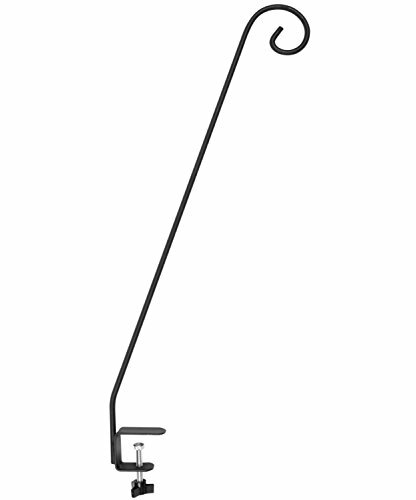 30 INCH PREMIUM QUALITY DECK HOOK WITH 2 INCH CLAMP- Intricately designed to enhance the look of your deck and garden. Ideally to fit on decks, railings, patios, backyard, pool house or any other landscaping projects that the clamp can be attached to. VERSATILE - Endless applications and useful for hanging bird feeders, plant baskets, flower pot, plant hangers, wind chimes, lights, insect repellant, decoration and much more. DURABILITY - Exclusive weather-resistant power-coated finish in black color is enhanced further by the supreme-quality weather resistant guarantee; unmatched by other products on the market. Versatility and grace simply exudes from this hook. IMMACULATE CONSTRUCTION - Double Forged-adjustable clamp fits onto to deck railings which can be unto 2 inch wide. Strong enough to hold weights of 15 lbs. GUARANTEED SATISFACTION - Your satisfaction is paramount as a valued customer. If you are not fully satisfied with your purchase, just send us the product for a full refund.